ChronosBH—ISS technology combined with Becker & Hickl electronics for precise TCSPC measurements using laser diodes and LEDs. 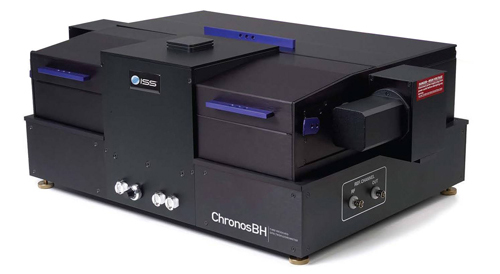 ChronosBH is a time-domain fluorometer with picosecond resolution. Its optical design and automatic instrument control are state-of-the-art for time-resolved fluorometers. Powered by Vinci - Multidimensional Fluorescence Spectroscopy. 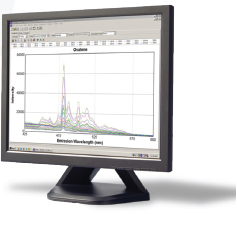 A powerful and flexible multidimensional fluorescence spectroscopy software with ready-to-use routines for data acquisition and analysis. ChronosBH is the instrument of choice for reliable time resolved data acquisition using laser diodes and LEDs. All hardware components, including external devices, are automated and PC-controlled. A sequence of measurements is acquired through a one-time setup of the experiment file, allowing for the automatic acquisition of multiple data sets. With its unique system memory design, Vinci allows user-specific access. In multi-user environments each user may perform measurements with a personalized instrument configuration. Decay time analysis is performed on multiple data sets using various models including multi-exponential, non-exponential and lifetime distributions. Anisotropy decay data analysis of up to three species using models for isotropic, anisotropic and hindered rotators.